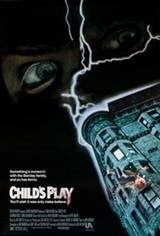 Child's Play seems to have been concocted by a parent who went berserk after standing in line for hours on end to purchase a Cabbage Patch doll in the early 1980s. The film opens with serial killer Brad Dourif taking refuge in a doll factory. Dourif is killed by the cops, but not before he has invoked a voodoo curse which transfers his soul into one of the dolls. That particular doll, nicknamed Chuckie, is unwittingly purchased by Catherine Hicks for her son Alex Vincent. Several murders occur shortly thereafter; all evidence points to Alex, who insists that his cherub-faced doll is responsible. Detective Chris Sarandon, the man responsible for Dourif's death, doesn't swallow Alex's story, but he agrees to investigate because he's sweet on Alex's mom. The slasher-flick ending of Child's Play would seem to have settled Chuckie's hash for good and all, but guess again--the film spawned numerous sequels.